Earlier this year I transitioned from a work desk with only a single computer connected to 3 monitors to a 3 computers each with their own monitor (one is a laptop). It was an interesting transition but it allowed me more computational resources and power and by using a fremium software called Synergy I was able to tie them together behind a single keyboard and mouse. But I had to make some sacrifices. The biggest for me was that the audio played on all of my monitors no longer came through the sound system attached to my primary workstation. The sound produced by my laptop and secondary workstation was separated. 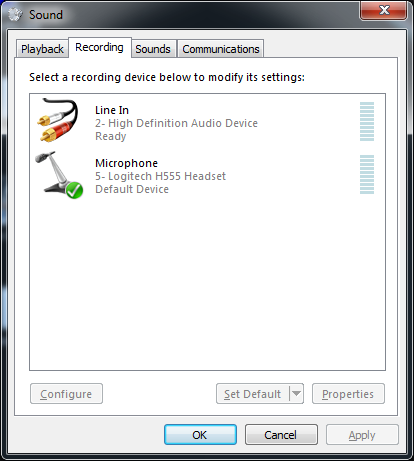 My solution was actually pretty simple and inexpensive: Use line in to play audio from an external device. In this case, my secondary workstation would play audio through the Line In port on my primary workstation so I could hear the audio over the speakers that are attached to my primary workstation. 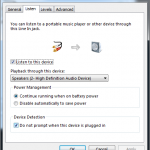 You can also do this with your cell phone, MP3 player, laptop or any device that has a Line Out or headphone port. I also use this method with my Android tablet so I can use it to play music from my MP3 collection or Pandora while I game so I can change songs or control music volume without the need to minimize my game. 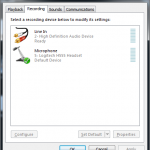 All you need to do this is a sound card with a Line in port (typically blue colored), a device with a headphone port and an audio cable with two 1/8-inch (3.5 mm) stereo-mini plugs on each end. Here is an example of one cable that Belkin makes but they can be found pretty much anywhere labelled as an “auxiliary sound cable” for use to connect an Mp3 player to a car stereo. It’s not as simple as making the physical connection though, the computer with the speakers has to be configured to play sound from the Line in. 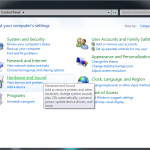 Luckily, that is very simple in Windows 7. 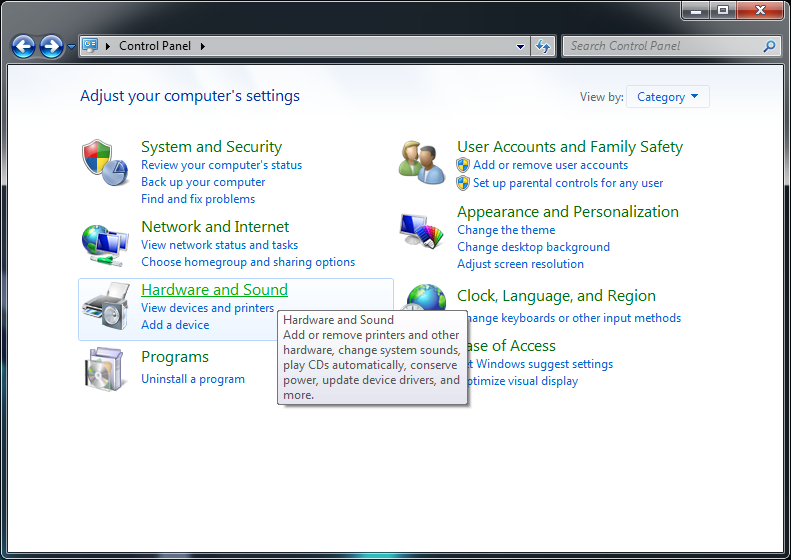 Clicking Sound will open the Sound control panel window shown. Click the Recording tab where you should see the Line In (if your sound card has one, some like my laptop do not have a line in). If you do not see Line In and you know your computer has a Line In port, right-click on the open area underneath the devices and click both Show Disabled Devices and Show Disconnected Devices. Double-click on Line In and then click the Listen tab. Check the box next to Listen to this device. 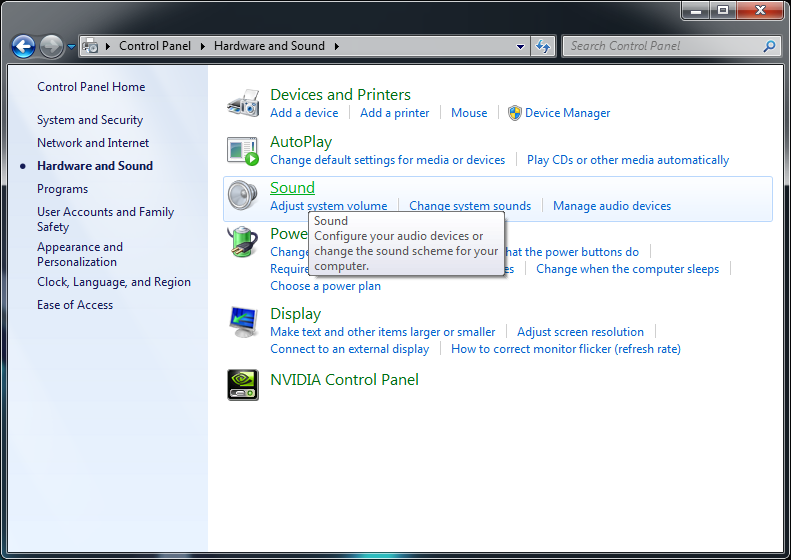 Under the check box, be sure to set Playback through this device to whatever sound card your speakers are on. In my case, I had 3 options, one was my actual sound card, another was my monitor (because it is plugged in through HDMI and has built-in speakers) and the third was my USB headset. Your last step is to open the volume for your Line In. 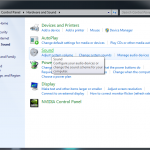 To do this go back to the Hardware and Sound window that you opened through control panel and click Adjust system volume. This will bring up your volume mixer. 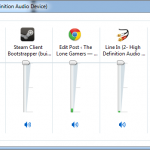 You may have to use the horizontal scroll bar along the bottom of the window to find Line In. In my case, I turned it all the way up because I will be controlling the output volume on my secondary workstation. 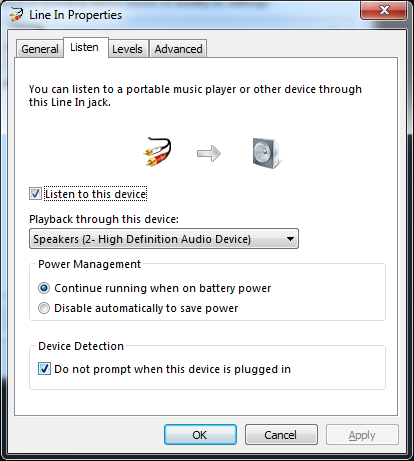 Once you have completed these steps, run a Line in audio cable from the Line In port on the computer that has the speakers connected to the Line out or headphone port on the computer that has the audio that you want to hear. You will probably have to tweak and fine tune the output levels to get them relatively balanced. Welcome to Rapid Unplanned Disassembly!